Which mature tech play is a better buy at current prices? Cisco Systems (NASDAQ:CSCO) and Microsoft (NASDAQ:MSFT) are often considered "mature" tech plays. The two companies mainly compete in different industries, but investors often buy them for stability and income instead of aggressive growth. But over the past five years, investors have clearly favored Microsoft over Cisco. Microsoft rallied nearly 110% during that period, while Cisco rose just over 50%. Past performance never guarantees future returns, but we should still see why Microsoft outperformed Cisco by such a wide margin, and whether it's still the better buy at current prices. Cisco is one of the largest networking hardware vendors in the world. Sales of routers and switches generated nearly half its revenue last quarter, but both businesses have slowed down in recent years because of market saturation, competition from cheaper hardware vendors, and the rise of software-defined networking (SDN) solutions for "white box" (generic) routers and switches. Cisco has been trying to offset that slowdown with heavier investments in higher-growth markets such as cybersecurity, collaboration tools, and wireless technologies. It then bundles those services together with its networking hardware in cost-effective packages for enterprise customers. Microsoft's vast ecosystem includes Windows, Office, the Xbox, Surface devices, and a wide array of cloud and IT services. Its biggest revenue drivers are Windows and Office -- which are being challenged by free operating systems (Android, Chrome OS, iOS, OS X) and free productivity tools such as Google Drive. Microsoft countered those challenges by making Windows 10 a free upgrade, expanding its free Office 365 services, developing iOS and Android apps, and investing heavily in Azure, its cloud platform. Azure lends out storage and computing power to businesses, lets companies create apps online, and serves as the backbone of its own cloud-based services. It also sparked a form-factor shift in laptops with the Surface, which turned 2-in-1 devices into a rare growth market within the sluggish PC market. How fast are Cisco and Microsoft growing? Cisco's attempt to pivot toward higher-growth businesses hasn't sparked impressive growth. Its revenue stayed flat at $49.2 billion last year, up 3% excluding the sale of its set-top-box business to Technicolor, and it's expected to slip 2% this year as reported before rebounding 2% next year. The company's revenue fell 3% as reported during the first half of 2017 (2% after excluding the Technicolor deal). During that period, its switching, routing, and data center revenue all fell year over year, while its security business, bolstered by a series of acquisitions, posted 13% growth. Its wireless and collaboration revenue stayed flat. Microsoft's total revenue fell 2% to $92 billion last year because of waning Windows OEM sales, its free Windows 10 upgrade plan, and a shift away from Windows Phones. But looking ahead, Microsoft's revenue is expected to rise 5% this year and 8% next year, fueled by the growth of its commercialized cloud services -- Office 365, Dynamics, and Azure. Those cloud services achieved an annual run rate of over $14 billion, up from $9.4 billion a year earlier. That growth indicates that Microsoft's goal of generating $20 billion in cloud revenue, nearly a fifth of its total revenues, by 2018 is likely to be achievable. That growth should offset waning sales of Windows licenses as the company generates more revenue from its cloud ecosystem. 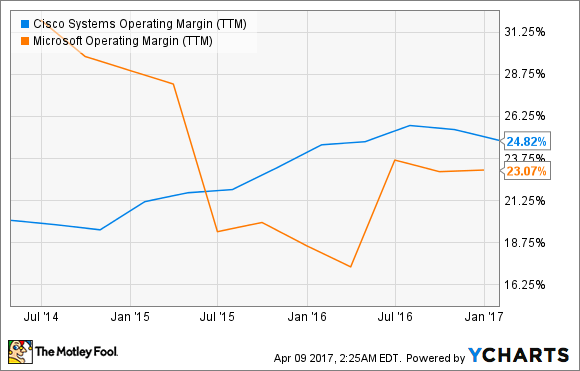 Hardware is generally a less profitable business than software, and Microsoft's operating margin was once much higher than Cisco's. However, Microsoft's higher investments in cloud growth, the writedowns on its mobile business, and its use of free software to gain more users have taken a toll on operating margin. Meanwhile, Cisco's shift away from hardware toward more software services such as security and collaboration enabled it to gradually post a higher operating margin than Microsoft. However, Microsoft's improving sales growth and its use of buybacks, totaling $14.8 billion in shares repurchased over the past 12 months, are expected to lift earnings by 7% this year and 10% next year. That earnings growth will fund its forward dividend yield of 2.4%, which is easily supported by a payout ratio of 69%. Microsoft has raised that dividend annually for 13 straight years. Cisco uses more moderate buybacks, totaling $2.7 billion over the past 12 months, to boost its earnings amid flat sales growth. Its earnings are expected to rise 1% this year and 5% next year. Cisco pays a higher forward dividend yield of 3.5%, which is supported by a payout ratio of 54% and has been raised annually for six straight years. Microsoft trades at 31 times earnings, which is slightly higher than its industry average of 29. Cisco trades at 17 times earnings, which is much lower than its industry average of 25. Microsoft's enterprise value-to-sales ratio of 5.5 is also more than double Cisco's ratio of 2.7. I think Microsoft's still a good long-term investment, but Cisco is the better mature tech play at current prices. Its growth rates aren't as impressive, but its margin expansion, higher dividend, and lower valuations all indicate that it's a smarter play for a lofty market.